Jessica Oreck has established herself as one of the most original voices in documentary. Her first film, Beetle Queen Conquers Tokyo (2009), was a new kind of nature film, as interested in fleetingly beautiful abstraction as it was in scurrying beetles. Her forthcoming film, The Vanquishing of the Witch Baba Yaga, which—full disclosure—I helped edit, is a unique and mesmerizing look at fairytales and the dialectical relationships between man, nature and history. These films are bracingly distinctive investigations of our connections and disconnections with the natural world and also ambitious explorations of nonfiction form. Oreck eschews narrative convention, building stories from lucid and startling moments to create rhythmic, relevant works of art cinema. Add in her other work—such as the excellent short series Mysteries of Vernacular—and you have a bona fide nonfiction auteur. On stage at Hot Docs 2013, taking questions after the screening of her second feature AATSINKI: The Story of the Arctic Cowboys, Oreck remarked that she was, for the first time with this film, able to realize her uncompromised vision (Baba Yaga had been shot before and was in the editing stage at the time). Because she photographed, edited and directed the film all herself, this feeling most certainly came from not working with close collaborator Sean Price Williams, who shot her other two features. But when experiencing AATSINKI, there seems to be more to the matter. This year in the life of two reindeer-herding brothers and their families in the Finnish Lapland is so austere in its approach, so quietly affecting in its execution, that one imagines the director (and her cinematic ideas) living inside the film. On first glance, AATSINKI may seem to be lacking some of the formal ambition of Oreck’s other work, but a closer look reveals a clear, singular vision. This is a quiet film. It’s easy to say it might be too quiet, but I’m convinced Oreck is okay with the idea that viewers may wander in and out of focus. There is hardly any dialogue, save the occasional in-the-moment banter from the unnamed Brothers Aatsinki (the press notes tell us they are Aarne and Lasse) and their ranching cohorts, but the images are consistently engaging and lovely. The film is closely tuned to the rhythms and rituals of the seasons, while unabashedly mythologizing the two handsome, tough-yet-sweet-natured men that fill many of the frames. The words “arctic cowboy” in the title denote the glorification acutely, but the word “story” seems to be a play on audience expectations. 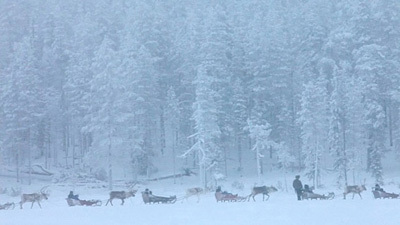 AATSINKI is a film about human herds and reindeer herds, weather, silence, landscape and work. No narrative is necessary, save the silent stories within the tempos of seasonal change. AATSINKI owes much to ethnography, but its engagement with moving forms makes it clear the director isn’t interested in a simply “factual” depiction of reality. When a stream of reindeer passes the camera, the images gradually end up in extreme close-up, as the animals are abstracted to achieve a kind of pure kinesis. Like the filmmakers at the Sensory Ethnographic Lab, Oreck wants to push past the simple recording of nature to get at something more ethereal. That she is “always in the right place” (in Al Maysles’ lingo for what makes a great cameraperson) indicates a keen understanding of the rhythms being recorded. Although she is an outsider (an important aspect to all of her feature film work), there is the impression of full integration here that comes from Oreck’s delicately composed frames. AATSINKI is best viewed as a part of the director’s continually growing body of work. That is not to say that the film doesn’t succeed on its own terms. If a viewer gives him or herself up to its lifelike pace and elegant images, AATSINKI holds many pleasures, some easily seen, some more discreet. But like many of the more idiosyncratic works of filmmakers like Chris Marker, this is a film best seen as the effort of a curious artist, endlessly intrigued by the way the world works and ambitious enough to share the mysteries discovered. In some ways this is Oreck’s most perfectly personal work; the quietly uncompromising vision is a statement of principle and a cause for celebration and continued allegiance.